Cornmint is a 100% pure, concentrated oil that has been obtained from the steam distillation process. The oil is used in the same ways as the peppermint oil as they contain the same therapeutic properties. Cornmint is a native to the cooler areas of Asia, Europe, Eastern Siberia, and North America. The herb is mainly grown for the extraction of menthol and in manufacturing the oil. Equally, the mint oil is obtained from the flowering tops through the process of steam distillation. This is 100% pure essential oil. It has a fresh, minty, menthol-like aroma. You may use it similarly to peppermint. Blends with Benzoin, Lavender, Eucalyptus, Lemon, Rosemary, Mint oils. Cornmint is a 100% pure, concentrated oil that has been obtained from the steam distillation process. The oil is used in the same ways as the peppermint oil as they contain the same therapeutic properties. Cornmint essential oil can stimulate the hippocampus of the brain. Major constituents include – Menthol, Menthone, Isomenthone, Limonene, and Pinene. Menthol – This is an organic minty substance that is seen in clear or crystal white form. Its pungent refreshing aroma has numerous health benefits. It helps in relieving muscle aches and cramps, chest congestion, sunburn and dental issues. Menthone – Mentone is one of the essential components. It is used in the therapy of respiratory disease for imparting a pleasant freshness sensation. It contains certain antiseptic properties. Thus, it is used in most of the oral care products. Isomenthone – This is an organic compound that is present in the essential oils like Cornmint. Besides, it is a colorless liquid which is clear in nature. It has a cool and menthol minty aroma. Isomenthone also plays a major role in human dermal fibroblasts. It possesses certain protective effects against tumor necrosis factor (TNF- α). Limonene – Limonene is an oil nutrient called as a terpene. It has a potent antioxidant and anti-inflammatory characteristics. Similarly, it is used in the treatment of metabolic and health issues. Equally good for weight management. Pinene – This is an aromatic compound seen in the cannabis. It serves as an anti-inflammatory, bronchodilatory, helps to counter short-term memory loss and promotes alertness. Cornmint can be used in treating the children (because it is gentle in nature). It is very beneficial to the nervous system. Besides, it helps in freeing the skin from acne and other skin conditions. Enhances the level of circulation, soothes sore muscles, beneficial for respiration, tones digestion, and helps the immune system to fight off colds. Cornmint essential oil can stimulate the hippocampus of the brain. Thus, it is worth for people who have mental fatigue and memory lapses. Alternatively, the oil is ideal for use in an aroma lamp in the office and in conference rooms also. How to use this Cornmint essential oil? For use on the skin: You have to dilute around 3-5% of this oil in jojoba or hazelnut oil. For the whole body massage: Mix 2% (i.e. 1 teaspoon (5ml) of this essential oil per 1 cup of carrier oil. In the case of Nausea and vomiting: Inhale through the diffuser or while travelling inhale a few drops on a tissue paper. Mental fatigue: Apply topically on the forehead 3-5% in any carrier oil. Headaches, Migraines, Vertigo, Fainting and other Nervous disorders: Topical application or in the diffuser (3-5%) in any carrier oil. Sore Throat, Flu, Colds and Respiratory troubles: Use through direct inhalation from the diffuser. Excessive Sweating and acne: It is worth to add around 1-2% to your unscented personal care formula. For Scabies, Ringworm, Dermatitis, Psoriasis: Apply topically. Neuralgia and Muscle Pain: Topical application 3-5% in hazelnut and jojoba oil. Asthma: Direct inhalation from the diffuser. Mucus Congestion and Stuffy nose: Steam inhalation is the best method. Fever: Topical application or diffusion on the whole frontal line and the forehead. Colic, Indigestion, and Cramps Intestinal Gas: Aromatic bath and topical application. For Palpitations: Whole body massage. Avoid contact with eyes and skin irritant. Not suitable for patients with cholestasis, gastroesophageal reflux disease. Similarly, do not apply to or near the face of the infants or children. There are very few or no customer reviews for this product. 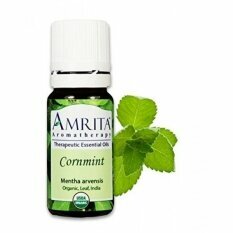 Cornmint essential oil is very high in menthol levels. It has a fresh and strong aroma i.e mildly bittersweet. There are many uses of this miraculous herb. It has a positive effect on the nervous system. Due to its antiseptic and antibacterial properties. The oil is mainly used in the body care and cosmetics industry to make everything from spas to industrial perfumes. It blends well with Clary, Sage, Lemon, Lavender, Peppermint, Spearmint and Rosemary. Moreover, the product is natural. Thus, there are no known side-effects yet reported from the users. Overall, most of the regular users are satisfied with this Cornmint essential oil. The Cornmint essential oil is available for sale online. You may buy them from the concerned site like www.amrita.net. They are available at an affordable price. Amrita Aromatherapy has a large collection of natural oils and therapy equipment. Moreover, purchasing from this site will make you satisfied. Since they are offering certain discount and coupon offers on all the purchase made from their site. You can avail free shipping on all the orders over $50, 10% off with the coupon code and 50% discount in all the essential oils. Further, you may visit the product’s website for more information. Aromatherapy is the use of essential oils for maintaining a physical, mental and emotional well-being. It is used in the hospitals, clinics and home care for the treatment of wide range of illnesses. What are the contact number and email address of Amrita Aromatherapy? The email address is support@amrita.net and phone number is (800) 410-9651. Can I get some information on the return policy? You may return an item using the 30 days return policy. But, you must request for return authorization by calling the customer service or through sending an email. What is the contact address?